1. Preheat the oven to 400 degrees F. Double-wrap the bottom and outside of a 9-inch springform pan with heavy duty foil. Mix together the crust ingredients and press into the bottom of the springform pan. Bake for 6 to 8 minutes, or until lightly browned. Remove from oven and cool completely. Reduce oven temperature to 325 degrees F.
2. Bring a pot of water to a boil for a water bath. Once the crust is cool, place figs on top in a single layer. 3. Beat together the cream cheese and sugar on medium speed until smooth and creamy, scraping the sides of the bowl as needed, about 3 minutes. Add the eggs one at a time, beating well until fully incorporated and scraping down the sides of the bowl between each addition. Add the heavy cream and vanilla and beat until well combined, about 1 minute. 5. Bake for 55 to 65 minutes, or until the edges are set, but the middle still jiggles a little. In a small bowl, mix together the sour cream, sugar and vanilla. Remove the cheesecake from the oven and spread the sour cream glaze evenly (and gently) over the top using an offset spatula. Return the cheesecake to the oven for 10 minutes. Keeping the oven door closed, turn off the oven and let the cheesecake rest in the oven for 1 hour. After 1 hour, remove the cheesecake from the oven, carefully remove it from the water bath, remove the foil and place the cheesecake on a wire rack to cool completely, about an additional 2 hours. Once completely cool, refrigerate for at least 6 hours (preferably overnight). 6. To make the Amaretto crème anglaise: Place a fine-mesh sieve over a clean bowl and have an ice bath ready (a large bowl full of ice that you can place the clean bowl in). Place the heavy cream in a medium saucepan and scrape the seeds from the vanilla bean into the cream (discard the bean). Warm over medium-low heat just to a slight simmer. Meanwhile, whisk together the egg yolks and the sugar until thick, about 1 minute. Once the cream simmers, slowly drizzle it into the egg mixture, whisking constantly. Return the mixture to the saucepan over medium heat and cook, stirring constantly, until it reaches 170 degrees F on an instant-read thermometer, and it thickens and coats the back of a spatula. Remove the pan from the heat and stir in the Amaretto. Strain the mixture through the fine-mesh sieve and place the bowl in the ice bath, stirring occasionally, until cool. Press a piece of plastic wrap against the surface of the crème anglaise and refrigerate until ready to serve (at least 1 hour). 7. 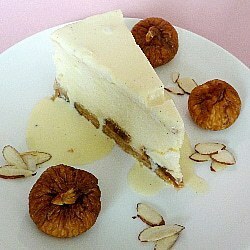 To serve: Plate a slice of cheesecake and spoon the Amaretto crème anglaise over top of each individual slice. Store leftover crème anglaise in an airtight container in the refrigerator; cover any leftover cheesecake with plastic wrap and store in the refrigerator. Both can be kept for up to 4 days. Wrapped, the cheesecake can be frozen for up to 2 months.